Exeter Chiefs have signed Australia back Lachie Turner on a deal until the end of the 2017-18 season. Turner, who can play on the wing or at centre, will join up with his new team-mates this week. He is the third Australia international to commit to Exeter in recent months, with Dave Dennis and Greg Holmes set to move to Sandy Park in the summer. 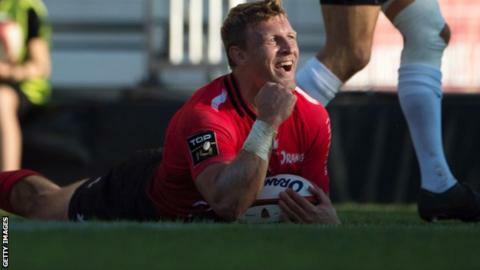 Turner, 28, scored four tries in seven games for Toulon this season, having moved to the club as World Cup cover. "We've tracked him for some time now and, once we knew he had finished his time with Toulon, we started the process of having a real good look at him," Exeter head coach Rob Baxter said. "Immediately you could see he was a very good rugby player and having really looked at his game, we believe he can really add something to us in terms of our back three options. "Now he's here, we will look to ease him gently following his flight over and then as the week progresses, gradually introduce him into full training with the squad." Turner has won 15 caps for the Wallabies and played for Super Rugby's Sydney-based Waratahs and Queensland Reds before moving to France last summer. "The fact he can play in numerous positions is a big thing, just because at times I've felt this season we have been a little bit exposed in certain areas," added Baxter. "I just feel if we are that little bit thicker and little stronger in certain areas, it will help us in the long term. "People will know that we are a club who like to bring through quality young players, but at the same time some of them you would say are relatively inexperienced when it comes to the Premiership and to Europe. Therefore it's important that we have a good balance in terms of our squad make-up."